A WYSIWYG, an acronym for "what you see is what you get", is an open content area for text, images, media, and more. It is the most flexible content area in the CMS, and you'll find a WYSIWYG editor in multiple elements that comprise page layout. The nice thing about a WYSIWYG is that every single one of them is identical which means you only have to master it once! How do you pronounce WYSIWYG and why such an odd name? According to Wikipedia, a WYSIWYG editor is a system in which content (text and graphics) can be edited in a form closely resembling its appearance when printed or displayed as a finished product, such as a printed document, web page, or slide presentation. So basically, what you see is what you get (roughly)! Can I put anything in a WYSIWYG? You can't put your cat in it. But you can put many other things in a WYSIWYG. In addition to the basics such as text and images, you can embed code from third-party media services such as Twitter and YouTube. Below is an interactive Google map of Carnegie Mellon. Look, we got a 4.7 star rating based on 300+ reviews! The .3 developed allergies to Scotty and were torn up about it too. WYSIWYGs make life easier, but I need to manually modify the HTML code. Is this possible? Yes! On occasion you might need to tweak the HTML code generated by the WYSIWYG to fix spacing or adjust styles. Click on the source code button in the toolbar to open an HTML editor. 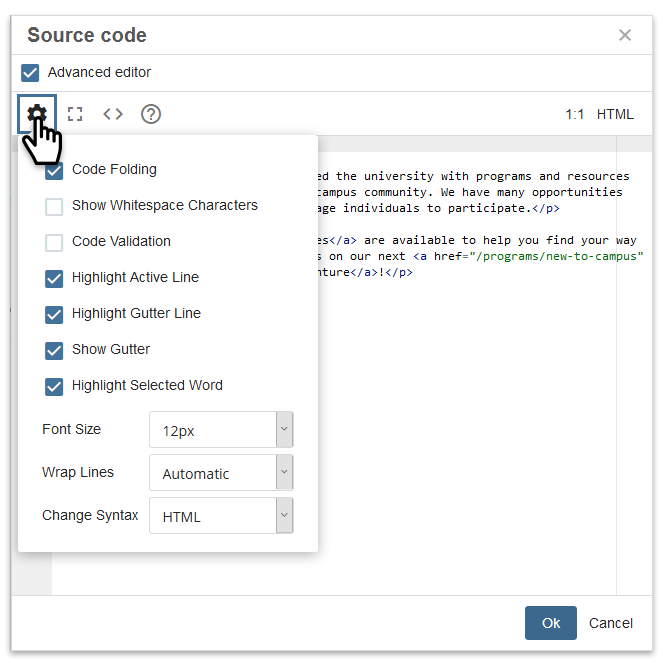 The HTML editor has options to assist you while you edit the source code. What can you config in a WYSIWYG? 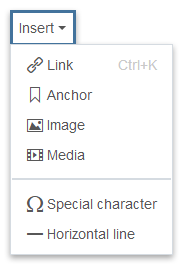 The toolbar at the top of the WYSIWYG editor contains options for assembling and editing content. You can fine-tune text and enhance content with images, links, media, and tables. The tools are defined below, links are provided if additional instructions are available. 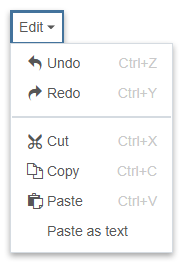 The WYSIWYG menus contain additional options plus keyboard shortcuts when available. The Edit menu contains options to Cut, Copy, Paste, and Paste as text. Paste as text removes all formatting/styling of text and converts it to plain text. The Insert menu contains the insertable objects available in the toolbar, plus options to insert a Special Character and a Horizontal Line. The Table menu contains the tools to build and modify a table; more on tables. The View menu contains options to assist you while you work in the WYSIWYG. 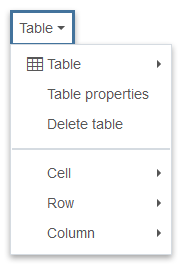 Visual aids pertain to tables; when enabled, outlines are displayed to represent table borders. Show blocks displays content regions that are designated as headings and paragraphs. 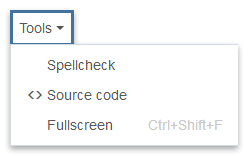 The Tools menu contains the option to perform a Spellcheck, plus the Source Code and Fullscreen view options available in the toolbar. 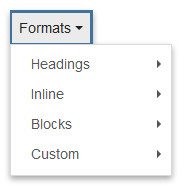 The Formats menu contains the option to apply formatting to content; more on applying formats.